The Mercantile is described as “the destination for vintage faire and handcrafted goods”. However, there is so much more to this unique shop and the downtown area it calls home. 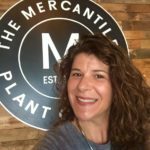 I wanted to explore The Mercantile and Plant City Florida to describe it’s attraction as a destination spot in the Tampa Bay area. Being only 19 miles away from Tampa and right off of Interstate 4, the journey to this up and coming historic downtown community is an easy one. My first stop…to get coffee! Yes, I made a cup of coffee at home before I left but there is something to be said about going into a coffee shop and ordering that special latte just the way I like it. 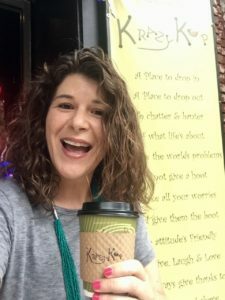 Nestled into downtown Plant City is the Krazy Kup, an authentic coffee house. The coffee house has quickly become the place to hang out on a Friday or Saturday night with their live music and cool retro atmosphere. 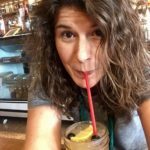 I got to meet the co-owner, Wenda while ordering…did I mention I wanted to use my blog to meet people? It was great to talk with her about her business. Anyway…With coffee in hand I was ready to explore The Mercantile. Yes my husband and parents own the shop, so ONE would assume I have explored it a million times; Yet I haven’t. Let’s face it when I come to Plant City it is usually to visit with my mum and dad and chase around our son Colin in the process, so I rarely get to peruse the isles and poke around. But this day was my #selfieday as I nicknamed it, and I enjoyed having a little “me” time. I have to be honest, as I was not planning to buy anything- I just wanted to get a sense of what was for sale and capture some pictures of the shop and town’s style by taking a few selfies here and there. Nevertheless, I found some items I could not live without. This is probably why it may be dangerous for me to work here on a regular basis- I’d shop too much! 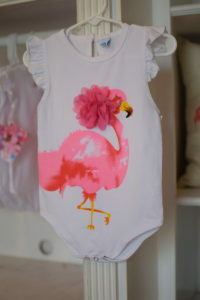 I found this adorable hot pink flamingo onesie for my niece. I figured if I was going to blog about style I should share as much of The Mercantile Style with others too. 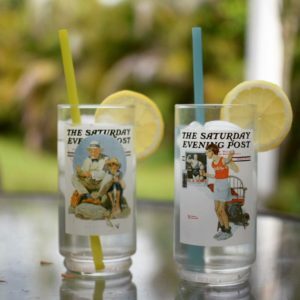 I also found a little something for myself, two vintage drinking glasses from Arby’s “Summer Scenes” collection of 1987. They picture Norman Rockwell artwork and the pictures spoke to me. I am looking forward to sipping an adult frothy beverage from them over the summer. Can’t wait to see my adorable niece in this hot pink cuteness! I was surprised at how much time I spent wandering around. Before I knew it – it was lunchtime. The cool thing about an up-and-coming area…there are so many choices of new places to go out to eat. I decided to check out The Corner Store, a local favorite. The staff was helpful and friendly and I took their recommendation and ordered their fresh blueberry peach lemonade- it was summer-tastic! I am looking forward to returning with Colin as they have the cutest play area- perfect for Moms who lunch. All-in-all I spent about 3 hours from arriving, parking, getting coffee, shopping The Mercantile, and eating lunch. I would certainly recommend The Mercantile as a destination. At home, enjoying my new glasses!